NextCan Insomnia Be Caused by Dietary Supplements? These days an old friend of mine is sliding deeper into dependence on alcohol. It’s sad and hard to watch. George stays with us twice a year while visiting his family, who live a few miles away. These family visits are fraught with discord. So by 5 p.m. George is often back at our house for the night—wine or whiskey in hand. New research explains how alcohol dependence causes insomnia that persists for many years after withdrawal. These days an old friend of mine is sliding deeper into dependence on alcohol. It’s sad and hard to watch. This friend—I’ll call him George –stays with us twice a year while visiting his family, who live a few miles away. These family visits are fraught with discord. So by 5 p.m. George is often back at our house for the night—wine or whiskey in hand. George suffers terrible insomnia. But you’d never know it during our happy hour, when he comes alive. He’s always ready with a toast to friends whose home, he says, is an oasis of calm next to the turbulence of his family. Toxic family relationships are George’s main topic of conversation during happy hour: his mother, a woman without much warmth whose love her sons still compete for; a bullying older brother; and a sister-in-law who stokes the rivalry already going between the brothers at every opportunity. In the past George’s negative feelings toward his family would eventually work themselves out—helped by the Finian’s—and then he’d get around to asking my husband and me about our lives. George can be a wonderfully attentive listener. He’s also got wide-ranging interests and concerns. A few years ago he confessed to worrying about the high doses of Ambien he needed to take to get even 3 or 4 hours of sleep. I can attest to the brevity of George’s nights. His room light has been on when I was up for bathroom calls at 1 or 2 a.m. And no sooner am I down the stairs at 5:30 than he’s in the kitchen asking for strong coffee. It doesn’t matter how wasted he feels, he says. Once he wakes up in the morning, it’s impossible to get back to sleep. Our happy hour conversation didn’t get very far on George’s recent visit. Each night he glommed onto the family drama and could not let it go. Nor could he stop drinking. One night he drank a beer and then a bottle of Pinot Noir and, just as he was heading toward the pantry for more, my husband and I fled up the stairs, begging off because of tiredness. Really it was the relentless talk about his family we wanted to escape. At midnight I tiptoed downstairs to adjust the heat and there was George, still drinking and talking on the phone. In the morning, he came down behind me for his coffee. But when I put the water on, he changed his mind: he was going back upstairs for a little more shut-eye, he said. That’s odd, I thought to myself. Never in all his other visits had George gone back to bed. Once he was up, he was up for good. My hunch was that he’d taken a sleeping pill quite a bit later than usual and, deciding it wasn’t working, got out of bed only to be hit by sudden sleepiness when the Ambien finally kicked in. George’s situation has taken a turn for the worse–there’s no denying it—and this is upsetting enough. But when I consider what lies in store for him, no scenario I can imagine looks good. Continuing to drink at the level he’s drinking now is compromising his overall health, and plainly it’s hurting his sleep. But new research shows that even if George does someday go in for alcohol treatment, his sleep may be irreparably harmed. Adenosine is a neurotransmitter important to sleep, and it’s through adenosine that alcohol exerts its effects on the sleep-wake system, say researchers at the University of Missouri, following a series of lab experiments. In rats never before exposed to alcohol, a single dose resulted in the rats falling asleep more quickly and sleeping more deeply. It did this by increasing available adenosine in the rats’ basal forebrain, an area crucial to sleep. In turn, the adenosine suppressed the activity of wake-promoting neurons there, thus promoting sleep. But in rats habituated to alcohol, withdrawal from alcohol had the opposite effect. It resulted in the rats experiencing significantly more wakefulness during both their activity and sleep periods–behavior that mimics the severe insomnia experienced by humans during acute alcohol withdrawal. Excessive wakefulness would normally lead to a robust build-up of adenosine in the basal forebrain. But during alcohol withdrawal this did not happen in the rats. Sustained use of alcohol down-regulates the adenosine system and blunts the sleep system, the researchers concluded, making it harder to fall and stay asleep. It’s not just during acute withdrawal that alcoholics experience poor sleep. Clinical studies have shown that sustained withdrawal from alcohol in humans causes insomnia and sleep fragmentation for years to come. My blog topics are usually more uplifting. But the only word for the story on alcoholism and sleep is bleak. However you choose to manage your insomnia—whether it’s CBT, meditation, sleep aids, alternative treatments or some combination of these–steer clear of alcohol, a harmful soporific close at hand. Oh no, how terrible. This is important information to share though, because surely there are many insomniacs who have resorted to alcohol. Not only does it have a sedative effect (at least at first) but insomnia in and of itself can make you very frustrated and anxious so I’m sure self-medicating is not uncommon. I had cut back to 1, maybe 2 drinks at the most per week after reading that alcohol may help you fall asleep but it also causes what sleep you get to be less deep and more fragmented. I had no idea it could re-wire the brain! I wonder though, is 1 glass of wine with dinner, once or maybe twice a week, going to have that effect? If you have it at least 4 hours before bedtime is that long enough? Yes, quite a few people use alcohol as a sleep aid. One study found that about 14 percent of people with insomnia between the ages of 18 and 45 used alcohol to get to sleep. Occasional drinking with meals doesn’t set you up for alcohol dependency or for sleep problems. The advice I generally hear is to refrain from drinking within 3 hours of going to bed. I’m in my mid 20’s and I’ve been drinking hard liquor and beer since 15 and I’m up for my 3rd day now because I quit cold turkey again last time was 5 days with a couple hours of sleep I can only get around 9 to 10 in the morning a few of those days I am perfectly fine when I’m working and on schedule but being laid off and having my pregnant girl leave me has left my mind racing at night and I know I’m Insomniac from it when I quit. and hopefully I’ll be getting a job well better job as I wash dishes in a bar 3 days a week at night soon to try to support my daughter when she’s born but in the meantime is there any remedies something I can do to help I’ve tried Benadryl that’s a joke I tried putting soothing rain noises on. but my head just whirls around for hours thinking about my problems here it is 5 in the morning again and I just can’t lay down anymore sincerely tired and annoyed. I’m sorry to hear about your trouble sleeping. It sounds like you aren’t getting much sleep and that being laid off and worrying about work is contributing to the problem. Excessive use of alcohol has probably contributed to the problem, too. The sooner you can curb this habit, the more likely it is that your sleep can improve. One key to good sleep is keeping a regular sleep schedule. You should always get up at the same time in the morning and go to bed at pretty much the same time every night. This is easier for people with regular daytime employment because they have to get up at a certain time every morning to get to work. Often it’s when people lose their jobs or retire that they start sleeping irregular hours, and that is a setup for insomnia. If after 15 or 20 minutes in bed you find you can’t sleep, then get up, go to another room, and do something quiet until you feel yourself becoming sleepy again. Only then should you go back to bed. Get in the habit of doing this whenever you can’t sleep. The worst thing to do is stay in bed, tossing and turning and worrying about your sleep. You want to break the mental association between your bed (and bedroom) and sleeplessness, and begin to associate your bed with sleep. These are general ways to go about improving your sleep. If it’s possible, though, it would be a good idea to see a doctor or therapist for help with controlling the drinking and a treatment for insomnia called “cognitive behavioral therapy for insomnia,” or CBT-I. If you’re unable to see a health professional for help with sleep, I can recommend a couple of online programs: Sleepio and SHUTi. Google them to find out more. 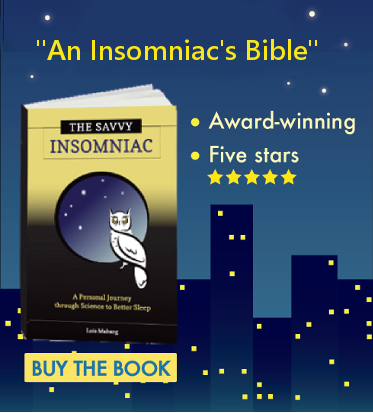 You can also get step-by-step guidance using a book, and this is the one I’d recommend: The Insomnia Workbook, by Stephanie Silberman. It’s available on Amazon, or you might be able to check it out from a library. There’s also plenty of information about CBT-I on this blog. 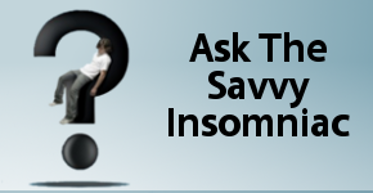 Go to the blog https://thesavvyinsomniac.com/blog/ and type “CBT” or “sleep restriction” in the site search box in the top right corner. Can Insomnia Be Caused by Dietary Supplements?